Alex is the only one in his primary school who is allowed to wear non-religious headgear. That’s because he’s been bald since he had his brain surgery. But that doesn’t matter much to Alex, even though it could make him feel – as he calls it – “ostrichsized (which is a better word for excluded (because ostriches can’t fly so they often feel left out. ))” No, Alex is concentrating on getting a scholarship to a good middle school. He’s also trying to figure out what’s behind all the strange things that have been happening since he had his tumor removed. 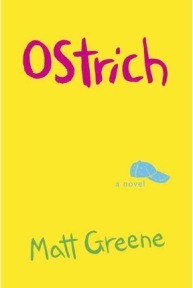 This is the novel Ostrich by Matt Greene. This is a story that slides. What I mean by this is that what it seems to be at the beginning, turns into something else at the end. Where we think Alex’s journey is taking him turns out to be towards somewhere else. And, apparently, even Alex doesn’t know exactly what his story is about, until it unfolds. Some have compared this book to Mark Haddon’s “The Curious Incident of the Dog in the Night-Time.” What these two books have in common are the mysteries that need to be solved, and the fact that they are told in first person from the perspective of a young boy, both of whom feel like they are outsiders in their own ways. They’re also both very intelligent with complex thought processes, and are each studying for an important exam. Furthermore, neither of these two boys can escape their conditions nor the impact that those conditions have on their lives. Despite it having a young protagonist as its narrator, I don’t believe this should really be categorized as a young adult book. There are far too many things younger readers – even those as precocious as Alex – might not understand. However, I can easily see this being read and thoroughly enjoyed by this age group – and that’s an anomaly. One reason for this is because Alex is such a wonderfully built character, who practically jumps off the page and into the reader’s warm embrace. Yet he has enough of those disturbing age-related qualities that you’ll want to slap him almost as often as you’ll want to smother him. Younger readers will identify with many of the situations that Alex finds himself in, while older readers will embrace him, as if he was their own child. This book is also being called a coming-of-age novel, but I’m not sure if that is totally correct, either. While Alex does come to an ultimate realization regarding himself and his life, he doesn’t really change because of it. Rather, those around him – his parents and his friends – are the ones who change. And this is what piques Alex’s curiosity and make him go on this intellectual journey. What keeps this from being overly sentimental is Greene’s astute use of humor, which in many cases will make the reader laugh out loud. This humor infects the whole story, and gives it a very honest and open tone that is chock full of energy, if slightly hyperactive. Unfortunately, when you start telling a story so dynamically, it isn’t easy to sustain. Because of this I felt the book dragged in the middle for a while before it regained vitality. This is my only criticism of this book. I have to admit finding it difficult to review this book. On the one hand, I want to make sure that I can get across just how special I found this novel. On the other hand, if I say too much, it might be considered a spoiler. Let’s just say that Matt Greene has given us a very unique story with a loveable protagonist who will take you on a weird and wonderful ride with his life and medical condition. I sincerely recommend this book and give it a solid four out of five stars. I would like to thank the publishers for sending me a review copy.